-- Charlie's (Charlie Day) mom, Bonnie (Lynne Marie Stewart), is a prostitute who can be found during the holiday season servicing mall Santas. And their elves. 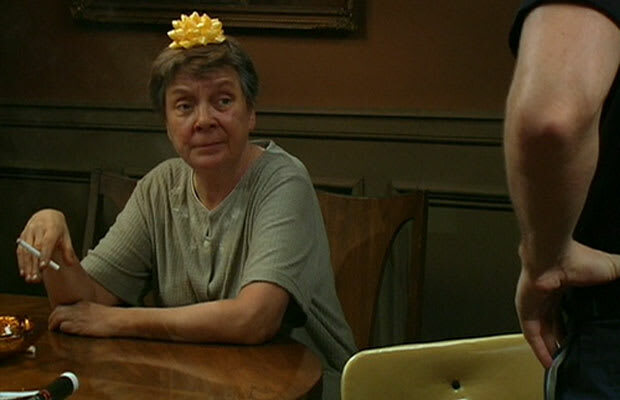 -- Mrs. Mac (Sandy Martin) is generally apathetic towards her son, Ronald (Rob McElhenney), but still managed to impart upon him that the meaning of the holiday season is to enter other people's homes and steal the gifts. -- Dennis (Glenn Howerton) and Dee's (Kaitlin Olson) mother, Barbara (Anne Archer) is a vain gold digger who died from a failed neck-lift, of course. She always favored Dennis over Dee, leaving the latter nothing in her will and declaring that she was a mistake. Seeing how Dee and Dennis are twins, we're not quite sure how that tracks, but OK.